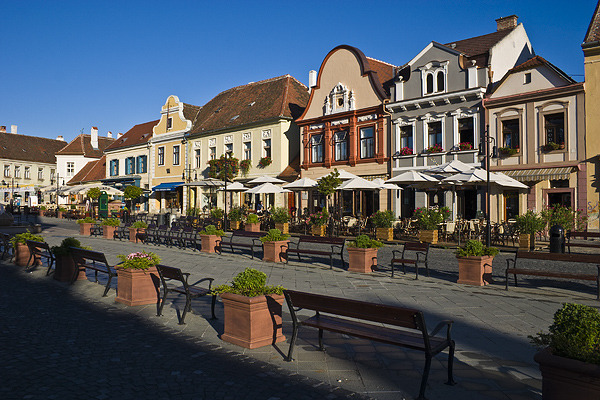 Kőszeg is located by the Austrian border in county Vas, 18 kilometres from Szombathely.Due to its location, the town had an important military role by protecting the country against recurring foreign attacks since the 13th century. According to Giczy (1994, p. 10), Kőszeg was the only town in the county of Vas that granted royal privileges in 1328 by King Charles Robert. In the Anjou times Kőszeg was one of the most important wine traders along with Pozsony (now Bratislava, Slovakia) and Sopron; yet, the town gained perpetual reputation at the time of Turkish invasion. In 1532, the brave defenders of Kőszeg castle – lead by Miklós Jurisich – have stopped the Ottoman army of Suleiman II on their way to Vienna. As the legend claims, after the Hungarian troops have successfully intercepted janissaries; Turkish troops left the town at 11 o’clock. To commemorate this event church bells of Kőszeg chime at 11 o’clock every day. Later, in the 16th century Kőszeg became an important trading centre of the Adriatic- Viennese basin. Over the centuries the town belonged to both Hungarian and Austrian authorities and then in 1648 it was given back to the Hungarian Kingdom. After the First World War – as an aftermath of Trianon Treaty – large territories of Kőszeg’s neighbourhood were attached to Austria. The town may have lost its markets, but managed to preserve its cultural role in Western Transdanubia. Several institutions were established, like the grammar school founded by the archbishop, an evangelical lyceum, a military school and one of the country’s first orphanages was built here as well. Fortunately, the Second World War did not do any harm to the buildings of Kőszeg; battles have avoided the town, so it was able to keep its old structure. Due to its relatively safe environment, the Holy Crown of Hungary was kept in a bunker of Kőszeg hills from 18 – 27 March 1945. The medieval lay- out of the town centre is clearly perceptible, since the streets are still following directions that once led to battlements. Giczy (1994, p.10) emphasizes that Kőszeg’s buildings preserved Central-European architectural styles, especially those of Southern Germany and Austrian territories. Great examples of these charming architectural relics are the famous Renaissance building called ‘Sgrafitto House’, the Gothic Sacred Heart Church, the eldest Town Hall of Hungary or the Baroque-styled Parish House – also known as ‘Lada House’. No wonder the town is called the ‘Jewel box of Hungary’; where Hungarian, Austrian and German impacts are fused into one beautiful historic treasure. Előző cikkMit jelent a korty hossza?